Most products on the market tend to go towards their mini versions at one point. Arcade video games, television sets, music players, telephones, computers, the list just goes on and on actually. Why does that happen? Well people like practical products and they like things that can be used anywhere and at any time and that don’t occupy THAT much space. And they are so light that can can be easily lugged around the house. Naturally, sewing machines also have their small versions. Are they good though? Should you buy one? What are the differences between them and the regular ones? And most importantly, which models are the best mini sewing machines and why? Let’s find out together right away. 1.1 What is the difference between the standard and the mini model? What is the difference between the standard and the mini model? Before we go any further, we should first make a brief overview or an introduction into the world of mini sewing machines. We’ll see what are their main traits, how do they compare to the regular ones, and if they are or aren’t a good choice for you. Obviously, their main advantage and trait is their small size. This means you don’t have to set them up before using them, that you don’t need to assemble them and lastly, that they are usually very lightweight so that you can easily fit them into a backpack or a training bag and take them with you wherever you go. They can be further separated on two varieties – tabletop and handheld. While the current guide focuses on the first ones, we have a separate guide to handheld sewing machines. The downsizing processes does carry some sacrifices with it so mini sewing machines don’t have all the functions and capabilities as a regular sewing machine would. But even so, some high-end models are much better than some low-quality regular ones which means that those small sewing machines can display some very good performances in various types of projects. The fact that these mini sewing machines don’t usually have a big amount of functions is actually a good thing. This makes them simpler to use and thus a great choice for beginners or sewing students. They won’t overwhelm the user with their capabilities and additional parts or features so inexperienced users can learn how to work with them in a really short time period. People who buy these mini sewing machines are mostly those who tend to switch locations often and they need a sewing machine by their side wherever they go. Students also prefer these to regular models because they can be a bit more simple to use and again, because they can fit into a backpack without any problems and afterwards used very quickly, since there is no need to set them up and waste time by doing so. Mini sewing machines aren’t that costly so people with a limited budget can afford them as well. In other words, if you need a machine that isn’t pricey, can be used easily and quickly, transported in a bag, and used in any place, portable models are the best choice for you. Now it’s time to check out some of the best choices for you, if you desire a lightweight sewing machine. If you’re looking for an affordable, small, simple use and very the lightweight sewing machine then this might just be a perfect choice for you. This is a basic model meant for complete beginners but that doesn’t mean experienced users aren’t welcome. It is after all advertised as fit for all users. What does it offer exactly? Who is it actually for? Should you buy it? Well I don’t know, let’s take a look. Despite the official company advertisement for this model, the machine is meant for beginners. The only thing that may attract some experienced sewing practitioners is the fact that it’s a portable model and its weight. At only five pounds, it is extremely light for a sewing machine. The manufacturer also made sure that it looks very easy on the eyes. I don’t know if male users will like the color though but I guess they can get a different model if a bright pink machine doesn’t suit their taste. Anyways, we should point out this model’s specifications now so let’s do that. Four stitch types and six stitch length and width variations offer a decent amount of customization possibilities for a mini sewing machine. Sew projects like purses or skirts with ease using five straight stitch types that allow basic sewing but also zipper inserting. Fix tears and rips on your clothes or create entirely new pieces with three zig zag stitch variations. Add your own original touch to your projects in the form of applique and embellishment with the Scallop/Crescent stitch variation. No need to be afraid of stretch materials, this machine can sew it easily with the multiple zig zag stitch variation. You can also work with heavy duty materials due to the possibility of lifting the presser foot very high. Straight stitch has five stitch length variations while the zig zag stitch has three stitch width variations. Free arm makes sewing cylindrical pieces like sleeves easy. Safety first! Finger guard prevents any accidental injuries. Reverse sewing can be done with the flip of a switch. Accessory drawer is great for storing some of your equipment. As you can see for yourself, this machine is quite capable. It is also very affordable so it really is a great choice as a first sewing machine in a sewing practitioner’s arsenal. It wouldn’t be fair to potential buyers if we skipped this part. This small sewing machine does have a few characteristics which could be better. First one on the list is the light, or more precisely, the lack of it. No light, no nighttime sewing. Working with very dark fabrics also could turn out to be a bit bothersome because of this. You can’t lower the foot and you can’t buy additional presser feet either. Finger guard is quite small so only those with slim fingers can actually use it. It uses only 12 and 14 size needles. To be fair these downsides may seem annoying but we’re talking about a mini sewing machine here so if we keep that in mind, it doesn’t have any major flaws. I love learning new things. But I have a weird tendency to jump in neck deep into things I know nothing about, just so I can learn them well and thoroughly because I’d drown otherwise. You too? Well in that case, this light machine is the one you need. A lot of features and functions, possibility of buying additional parts, a few systems perfect for beginners, a lot of capabilities appealing to the more experienced users. These are just some of the main traits of this mini sewing machine. Mini sewing machines don’t usually have the characteristics of this model. This one seems closer to regular sewing machines actually but even so, it’s very lightweight and easy to carry around. It also received an award as a recommended choice by 9 out of 10 women customers apparently. How about we take a glance at those specifications now. You can create almost anything you imagine thanks to the 27 unique stitches like decorative, blind hem, quilting stitches and more. Although I believe quilting would be a bit troublesome on a small machine like this one. Six included presser feet consist of button sewing foot, buttonhole foot, blind stitch foot, zipper foot, zig zag foot and a narrow hem foot. You can also purchase additional ones if you wish. Automatic needle threading, one step auto sized buttonholer and a jam-resistant bobbin system are very beginner friendly. LED light allows you to sew at night and to work with very dark fabrics. Accessory tray for easy storing of your equipment. Brother always likes to fill up their sewing machine boxes with complimentary accessories so if you buy this model you’ll get a darning plate, accessory bag with needle pack, twin needle, screwdriver, extra spool pin, three bobbins, power cord, an instructional DVD and an operation manual. This machine has one important flaw. It’s actually meant for experienced sewing practitioners. And it’s too much like a regular sewing machine. Allow me to explain. The number of stitches is too great for a beginner who seeks a simple to use mini sewing machine. Presser feet must be changed when you want to do the kind of work each one is meant for. Why do quilting on a small sized machine at all? The fact that it comes with an Instructional DVD is the only reason why it can be called user friendly. But as mentioned before, if you are s beginner and you like to start a game from level 5, it’s good for you. But if you prefer learning the normal way, from the start, from easy to more and more difficult, think again before buying this model. The other problem is that it’s too much like a regular machine. It’s pretty heavy for a mini machine, weighing over 12 and a half pounds. Add the presser feet, all those accessories and the instructional DVD to that and you end up with a pretty heavy backpack. Plus, it has the capabilities which you don’t need from a small sewing machine. Who sews curtains or bedsheets at their dorm? On a small machine? Janome is one of the, if not the best when it comes to sewing machines. They know exactly what their customers need and they know how to give them just that, not a thing more and not a thing less. This model is like that as well. 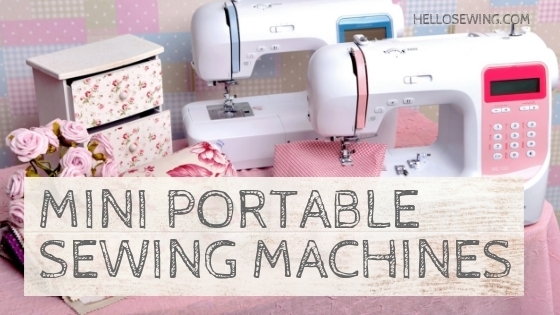 It offers everything you need from a sewing machine with a small footprint. Not a thing more, not a thing less. See for yourself, see if it suits you. Go ahead, read on. Janome Sew Mini is a perfect example how less can be more. At first glance it seems like a toy or a sewing machine meant for kids. But it’s far from that. It can do any kind of work expected from a mini model and it’s very simple to use. But let’s see those specifications first. 4-piece feed dog provides a steady grip on the fabric and allows you to do precise work. Top drop in bobbin is easy to set up and doesn’t waste your time. Presser foot can be lifted very high, allowing you to sew heavy duty fabrics. You can conduct reverse sewing easily with the help of a switch that is located on the front of the machine. Free arm means you can sew cuffs and sleeves. Accessory tray allows you to store some equipment inside the machine. Very lightweight at only five pounds. Perfect for carrying around in a backpack. This mini sewing machine is also quite affordable so don’t worry if you have a limited budget. Janome machines are quite trustworthy as well so you don’t need to worry about them malfunctioning. Two flaws worth mentioning when it comes to downsides. This model doesn’t have a light so you can’t use it in areas that aren’t brightly lit. Working with darker fabrics may prove to be a bit more eye-straining as well because of this. The other flaw is the fact that it doesn’t have a buttonholer. You’ll have to put zippers instead. This mini sewing machine shows that they can be more capable and have more functions than some regular sewing machines. If you want a mini machine which offers a lot of customization possibilities and is able to perform a wide variety of tasks, this may be a suitable choice for you. No need to waste time anymore, let’s move on to the review. Plenty of stitches, accessories, additional parts and a decent sewing speed are some of the main traits of this model. It is advertised as a beginner sewing machine but if we take a look at some other small machines and compare them with this one, this one would definitely turn out to be aimed at experienced sewing practitioners. It’s time to see what exactly does this model offer. 32 types of stitches separated into categories. 6 basic stitches, 6 stretch stitches, 19 decorative stitches and one buttonhole stitch. You can sew all kinds of projects and add your own touch to everything you create. Automatic needle threader and automatic buttonholer make your work simpler. Presser feet are easily snapped on and can be positioned very high. Maximum sewing speed of 750 stitches per minute will cut the time you’ll need to finish your fashions. Flip the switch and sew in reverse. LED light illuminates your work area. Accessory tray comes in handy when transporting the machine. The packaging contains a lot of accessories. Inside it you’ll find an all purpose foot, zipper foot, buttonhole foot, button sewing foot, seam ripper with lint brush, edge/quilting guide, needles, thread spool caps, bobbins, screwdriver, darning plate, soft-sided dust cover, machine intro dvd, instruction manual with stitch guide, foot control, power cord. One major problem really throws all of the good traits this machine boasts into the shadows. You can’t trust it. Sometimes, the needle threader can’t seem to work no matter what. Other times, the thread gets bundled and makes a huge mess. Also, the bobbin system tends to malfunction. A lot of people got their machines basically broken, because they wouldn’t work straight from the box. And just sending the machine back for analysis will cost almost as much as the new thing which doesn’t even make any sense. Of course, not all of them are like that, you may purchase one that will work perfectly and for a long time. But the question remains. Is it worth the risk? Unlike the previous models we reviewed, this one isn’t made by a giant like Janome or Singer. But does that mean it isn’t as good? Probably. But it doesn’t mean it’s bad. We did put it here with other best mini sewing machines after all and that wouldn’t have happened if it were bad. What is it good for then? Who is it for? What can it do? This compact sized sewing machine is mainly advertised as an ideal gift. It’s good for both beginners and experienced sewing practitioners so it really can be a nice gift for a person who loves fashion or sewing. As far as capabilities go, it does have a nice number of functions. Not too much so it doesn’t overwhelm the user but not too few either, which means it can do a variety of projects. Without further ado, here are its specifications. 12 stitches of which 4 straight stitches, 2 buttonhole stitches, 2 pattern stitches and 4 overlock stitches. Work on stretch materials, insert zippers, add decorations and more. Adjustable stitch length and width offer some customization possibilities. Two settings for sewing speed allow you to speed up if you’re short on time or take it slow if you like to be cautious..
Presser foot can be replaced for different needs but you’ll need to buy additional ones if you want to do that. Work area is illuminated by a light, making nighttime sewing possible as well. Reverse switch allows easy reverse sewing. This machine can sew on five layers of fabric. You won’t get a lot of accessories or additional parts in the original packaging this time. Foot pedal, power adapter, needle threader, four thread spools, a spare needle, a user manual and of course the machine itself is what you should expect in the original box. One major issue that seems like a giant red flag is the official manufacturer’s description. Don’t do this or you’ll brake it, don’t do that or the machine will malfunction, be very careful with this because the machine may get damaged. You don’t want your machine to be so delicate. Yes it may just be a precaution but if that’s the case, why put it in the advertisement? It’s causes an odd feeling this way and I believe it does turn a fair number of potential buyers away from this product. Come here little Timmy! You too, little Jessica! It’s time for you to learn how to sew! If you think your kids would like to learn how to sew or if you need a very compact sewing machine then you should consider purchasing this model. It doesn’t offer much but it is a very good choice for kids. Let’s check out the review together. Simple sewing work or small fixes are this machine’s area of expertise. Small and lightweight with a possibility of running on a battery power source, ideal for children users. Let’s take a look at its specifications. One stitch type only. Connect two pieces of fabric or create some small and simple projects like shopping bags or decorative handkerchiefs. Extension table gives you a larger work area. Great for sewing on larger pieces of fabric. Cuff slot lets you sew cylindrical shapes. Can work on an adapter or a battery power source. Bobbin replacing is made easy thanks to the automatic bobbin rewarding. The box contains an extension table, an adapter, a needle and a needle threader, four bobbins, a manual and of course the machine. It’s obvious what the downsides are. This is a miniature sewing machine meant for children after all. It can’t do any serious work nor can it sew on any fabrics other than really thin ones. This is the long lost twin brother of the previous model. We could just copy paste everything from the previous review here. Cheap, basic and good for kids. Two work speeds, slow and slower. Comes threaded, can be used straight from the box. Night light brights up your work area. Can run on batteries so you can use it anywhere. Weighs a tad more than two pounds, super lightweight. Box contains the machine, a foot pedal, an extension table, a needle and a needle threader, four bobbins, a power supply and a manual. Just like the previous model, this one isn’t meant for some serious work. Quick fixes or small projects can be done easily though. The two previous mini machines have a sister it seems. She’s a bit more strict and tough though. This model is very similar to those but there’s one big difference. This one isn’t good for kids. Basic straight stitch only. Decoration or repairs are this machine’s forte. Comes threaded so you can start sewing as soon as you unpack it. Weighs less than three pounds so it’s easily carried around. The machine is really hard to thread. It does come threaded but you’ll have to thread it again sooner or later. It also tends to jam often and pieces brake sometimes as well. I guess the low price can be a risky choice. Let’s not beat around the bush and face the facts. If you want a mini sewing machine you need one that’s lightweight, easy to use, can do a wide variety of projects but doesn’t overwhelm you with unnecessary features, is affordable and most importantly, is dependable. I think the best choice among these is pretty obvious. Janome models win this time. Fast Lane or Sew Mini offer everything you need from a small sewing machine and don’t have any features you won’t be using. Maybe they aren’t perfect but they come close.